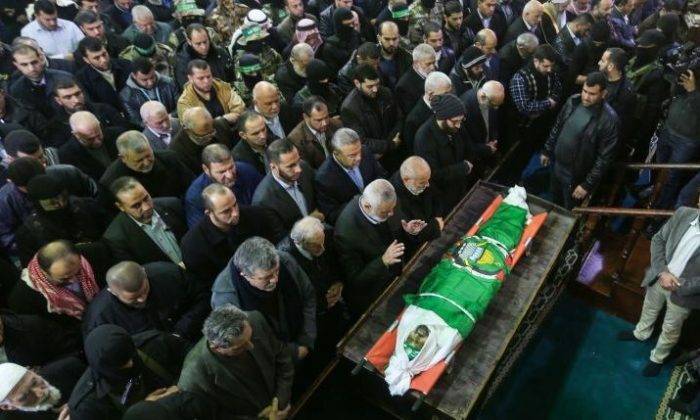 Palestinian mourners pray over the body of Hamas senior leader Imad al-Alami during his funeral at the al-Omari mosque in Gaza City on Jan. 30, 2018. A co-founder of Hamas died Tuesday, about three weeks after he shot himself while cleaning his weapon, officials said. Imad al-Alami was “examining his personal weapon in his home” in early January when the gun accidentally went off, shooting him in the face, said Hamas, a group that has been listed as a terrorist organization by the U.S. Department of State since 1997. In 2003, the United States called Alami him a “specially designated global terrorist,” the BBC reported. The Jerusalem Post reported that he was hospitalized in Gaza until he died. Initially, Hamas said that he died of natural causes, but it later admitted that he accidentally shot himself. Hamas-run Interior Ministry Spokesman Iyad Bozm told the paper that he “mistakenly” shot himself. Alami was described by the Post as a Hamas “hard-liner” who supported the group’s “ties with Iran.” Alami was a Hamas member since the late 1980s and also the first Hamas representative to Iran. “Hamas was Abu Hamam and Abu Hamas was Hamas…He was able to deal with changes and transformations and prescribe [appropriate] policies and strategies for the different periods of time,” Hamas Politburo Chief Ismail Haniyeh said of the leader. During the Israel-Hamas war, he went to Turkey for treatment to his leg, which he lost, Fox News reported. Hamas said he was hurt in the 2014 conflict. The Times of Israel reported that Alami left Damascus for Gaza in 2012 following the start of the Syrian civil war. Hamas leader had expressed their support for forces fighting against Syrian President Bashar al-Assad. According to Newsweek, he’s also said to have ties to the Lebanese militant group Hezbollah, a proxy group of Iran, as well as its leader, Hassan Nasrallah. Hezbollah was also deemed a terrorist group by the U.S. State Department in 1997.